Premier Rewards Gold refresh: 4x USA dining, groceries, $10/mon dining credit. $250. As per others, my wife wanted the new rose gold option (she has a supp card on my legacy Gold PRG account); I had to get the rose gold card too for my card as the primary (basic) cardholder on the PRG account - my Centurion RM took care of all of this for us, and cards are on their way. Card number doesn't change. but expiry and CVV does so will need to update any re-occurring payments. Statman, lax01, 355F1 and 1 others like this. I'm guessing the rose gold is going to very similar to the iPhone rose gold. It's a collector's item. Get the Rose Gold now. If you really don't like it, you can always ask them to send for the standard gold one later. It's a collector's item the way that Batman cups at McDonalds are collectors items. I don't care for the color myself. My Capital One card used to ask me to personalize the image on it. But every photo I sent in they rejected, claiming it was copyrighted. They were all photos I took myself. I could go for a personalized Amex. had you not seen rose gold before? I still keep my old Citibank card issued in 1990s. It gets my picture on the front Super nice. Do you submit an updated image? When I did the chat to get the rose gold, the CSR pasted some legalese about it being a “product change”, which I found odd. It seems in the system the rose gold gold card is its own product. I guess that’s how Apple Pay can display the right image etc. It also says all future replacements will be rose gold, past the 1/9 deadline. I mainly got the rose gold because I also have the BGR in my wallet and it’s annoying that they’re almost identical. I don’t mind the color though. Already switched all US restaurant spending to it from the CSR. Not sure how long 4x will last. What do you mean your AMEX page? You just logged in and it popped up there? Or did you click links? For instance, I log in, see my existing Amex cards. Scroll down to the bottom and I can click Credit Cards and it shows "Featured" cards but then I can click Rewards card and it will show the Gold card but with the 25k offer. The Platinum card offer is for 60k points. 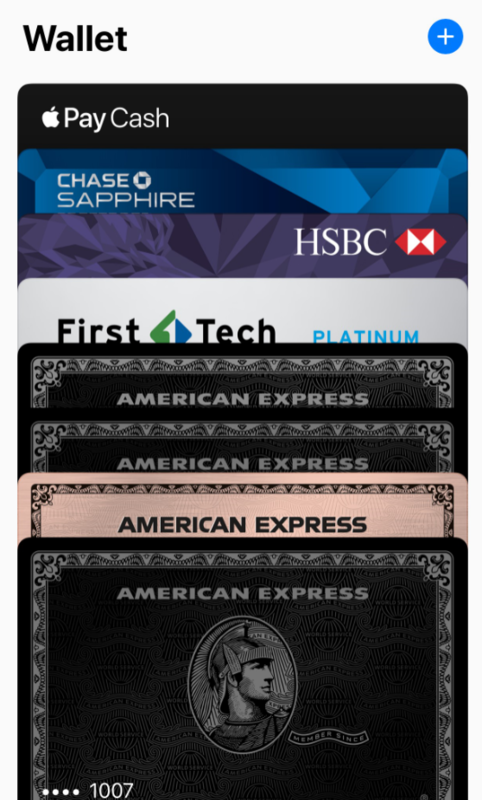 I had the Platinum Amex last year and I canceled it earlier this year. But I had the PRG through early 2017 when I upgraded to the Platinum. So maybe too soon for them to offer me the bigger offers. The 50k MR for $2k spend on the new AMEX GOLD popped up on my pre-qualified cards page on my AMEX.com profile. I also got an email inviting me to apply. I applied for the card today and was approved. I got the Rose Gold.....haha....even though it looks pink. I check card match tool once in awhile to see if I can get the 100k MR for the PLT but it has never showed up--until yesterday. I didn't jump on it, and it is no longer showing on the website with the 100k MR SUB. I think I will be better off with this GOLD card as I already get membership to the One World First Class lounges at LAX, LHR, & HKG, which is most of my travels--all of my travel is for fun, not business. It's pretty annoying that when I go to the AMEX website, the default offer for PRG is 50k MR for $2k spend. But when I log in to apply, it tells me the offer is no longer valid and has me click through to a page that only offers 25k. AMEX definitely not showing me the love! I have a Centurion account in the UK and another one in the US. For the UK product, the main cardholder gets issued a 2nd card on their account (it's called the Additional Card) - idea is that you can use it to separate spending between business/personal. The AC is issued in plastic, which also helps with the automated machines at train stations and car parks that 'ingest' your card as the metal versions had a tendency to get stuck in the mechanism. twkidM3, cuthroat and JONJON451 like this. A bit shocked that they won't even do centurion holder a small favor of 'differently colored card'. Last edited by mia; Oct 6, 18 at 4:57 am Reason: Please do not "quote" images. American Express Referral Offers (Read Wiki before posting).